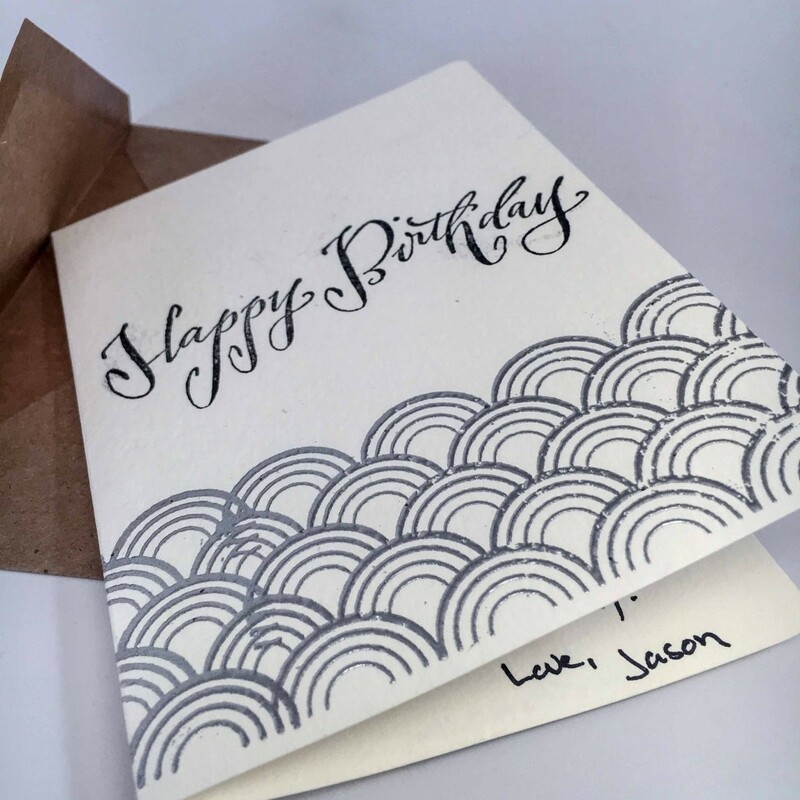 I used some items from Paper Source to make this card. My uncle Jim’s birthday is today – I am pretty sure that he is turning 86. He has had a rough couple of years with his health but he’s a fighter. That shouldn’t surprise me, he’s a Command Sergeant Major Retired from the U.S. Army. He’s a man of few words, I treasure each of them. 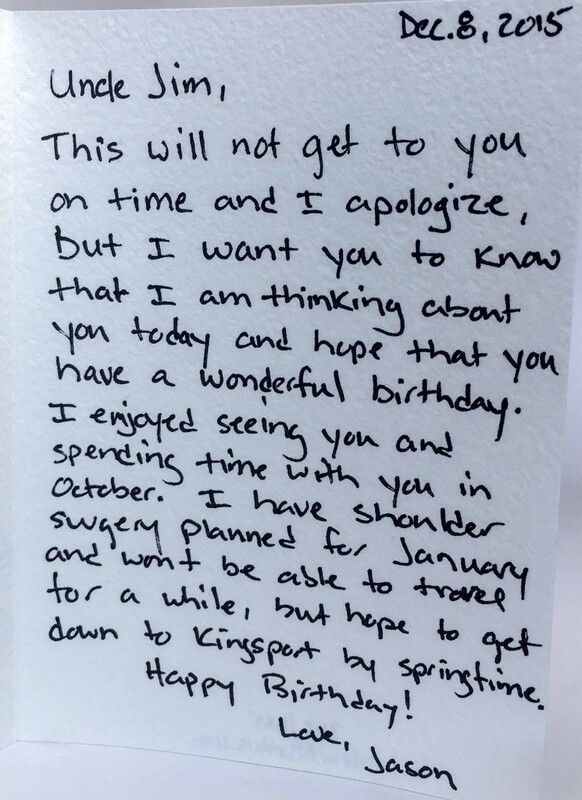 This will not get to you on time and I apologize, but, I did want you to know that I am thinking about you today and hope that you had a wonderful birthday. It was good to see you and spend time with you in October. I have shoulder surgery planned for January and wont be able to travel for a while, but I hope to get down to Kingsport by springtime. 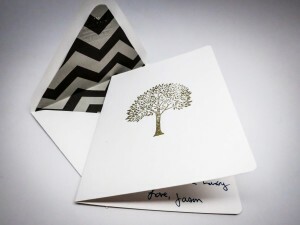 Today’s letter is to my cousin Jonathan and his wife Aleks. They live in Tennessee so I don’t see them that often unfortunately. I wish we lived closer. 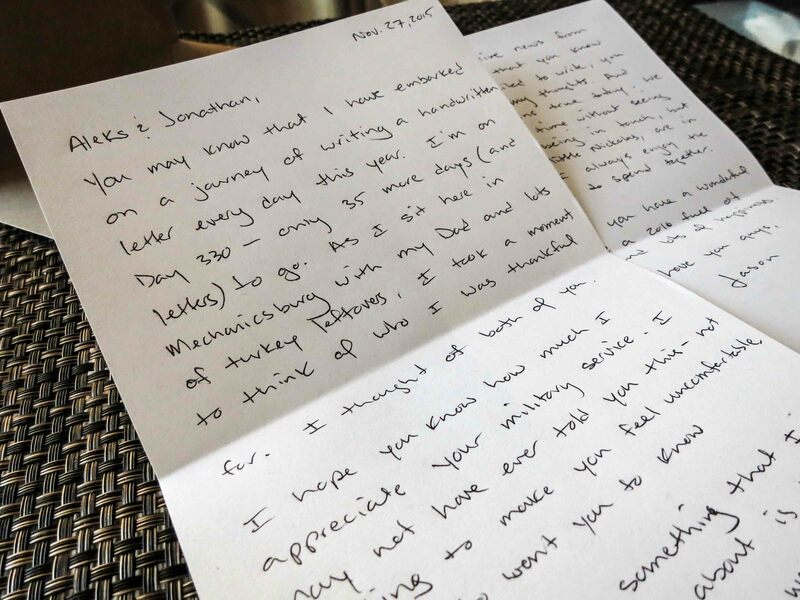 Both have served in the U.S. Army and I wanted to let them know that I appreciate their service – even if my letter comes nearly a decade late. I’ve heard from friends of mine who have served that it’s “awkward” when people thank them. “I was just doing my duty” or “I’m just doing my job” they’ll often respond. Maybe so, but I admire them and am grateful for their service. You may know that I have embarked on a journey of writing a handwritten letter every day this year. I’m on Day 330…only 35 more days (and letters!) to go. As I sit here in Mechanicsburg with my Dad with lots of turkey leftovers, I took a moment to think of who I was thankful for. I thought of both of you. I hope you know how much I appreciate your military service. I may not have ever told you this – not wanting to make you feel uncomfortable, but I wanted you to know. Jonathan, something that I have always felt a bit bad about is that I never wrote when you were posted in Iraq. Having lived abroad, I know how nice it is to receive news from home. I hope that you know that while I failed to write, you were present in my thoughts. And the same remains true today. We can spend a long time without seeing each other or being in touch, but you both, and little Nickolas, are in my thoughts. I hope that you have a wonderful Christmas and a 2016 full of good health and happiness. 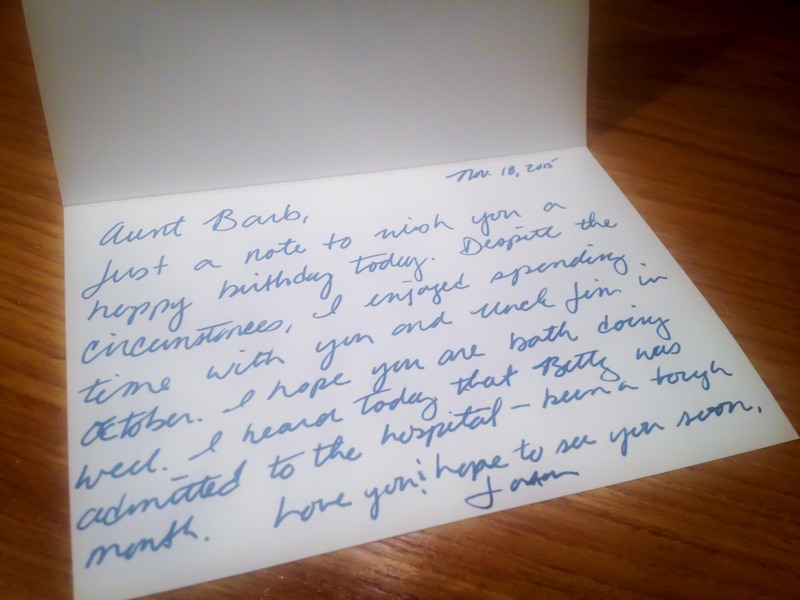 Today is my Aunt Barb’s birthday. I got to see her last month – she always cooks a delicious meal when I’m down at their place in Kingport, TN. Just a note to wish you a happy birthday today. Despite the circumstances, I enjoyed spending time with you and Uncle Jim in October. I hope you are both doing well. I heard today that Betty was admitted to the hospital – been a tough month. Last week I attended the funeral of my Aunt Sue. Although funerals are always sad for me, the coming together of family helps us heal. One person that I got to see last week was my Aunt Betty – Sue’s older sister. I know she has not been feeling well and I wasn’t sure she was going to be able to make it to the funeral. Aunt Betty, along with my Uncle Larry, made the trip to Richlands for the funeral. She looked great and I was very happy that she was there. Today is her birthday and I wanted her to know that I was thinking about her. I wanted you to know that I am thinking about you today on your birthday. Despite the circumstances, it was good to see you last week in Richlands. 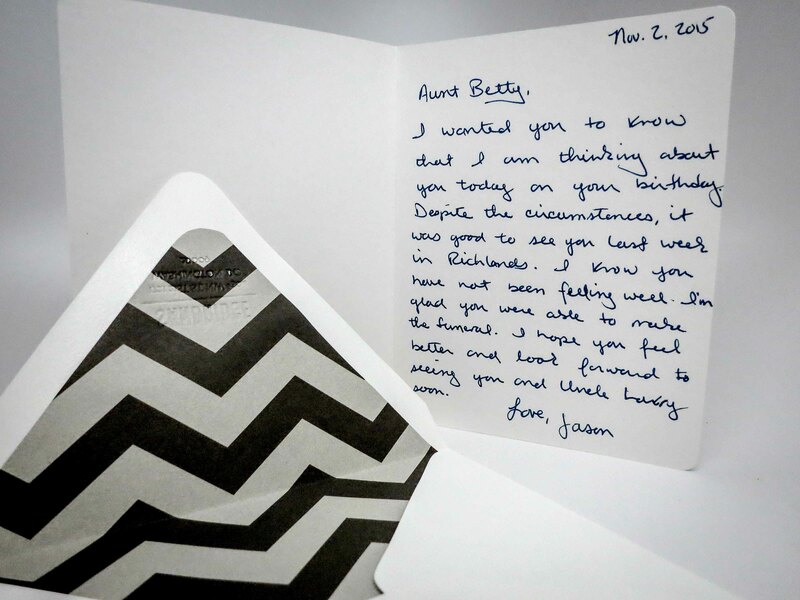 I know you have not been feeling well – I am glad you were able to make it. I hope you feel better and look forward to seeing you and Uncle Larry soon. I spent the last week in Kingsport, TN. I traveled there to see my 81-year-old aunt whose health had been declining dramatically. She passed away about four hours after we arrived. And while the week was filled with mixed emotions, the bright part of it all was spending time with family. On Wednesday night, we went to dinner with my cousin Stacy and his family to a restaurant I hadn’t tried before: Stir Fry. Good spot if you are traveling through Kingsport. Thank you so much for dinner Wednesday night. 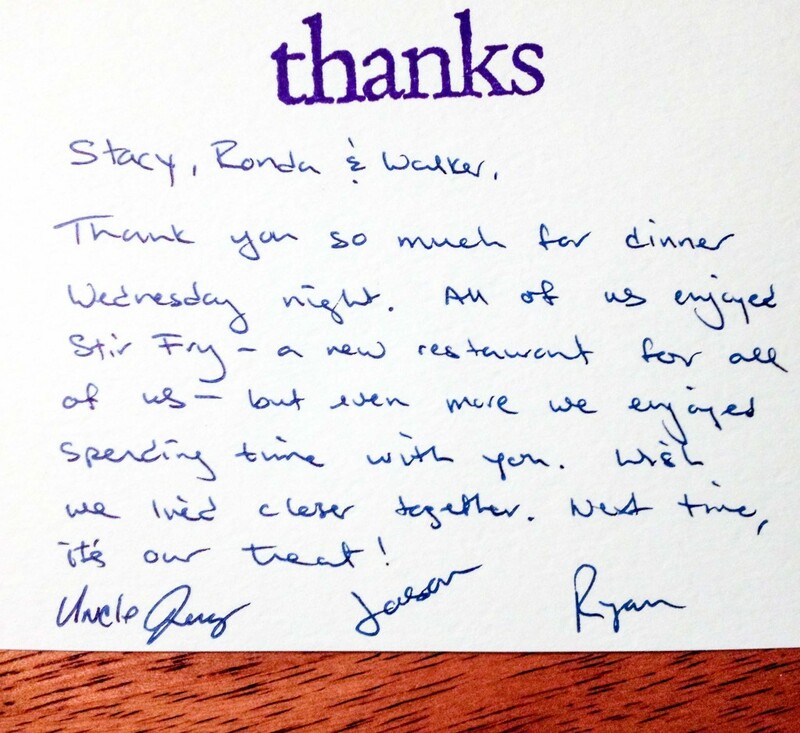 All of us enjoyed Stir Fry – a new restaurant for all of us – but even more we enjoyed spending time with you. Wish we lived closer together. Next time, it’s our treat!